For other uses, see Beech (disambiguation) and The Beeches (disambiguation). Beech (Fagus) is a genus of deciduous trees in the family Fagaceae, native to temperate Europe, Asia, and North America. Recent classification systems of the genus recognize 10 to 13 species in two distinct subgenera, Engleriana and Fagus. The Engleriana subgenus is found only in East Asia, and is notably distinct from the Fagus subgenus in that these beeches are low-branching trees, often made up of several major trunks with yellowish bark. Further differentiating characteristics include the whitish bloom on the underside of the leaves, the visible tertiary leaf veins, and a long, smooth cupule-peduncle. Fagus japonica, Fagus engleriana, and the species F. okamotoi, proposed by the botanist Chung-Fu Shen in 1992, comprise this subgenus. The better known Fagus subgenus beeches are high-branching with tall, stout trunks and smooth silver-grey bark. This group includes Fagus sylvatica, Fagus grandifolia, Fagus crenata, Fagus lucida, Fagus longipetiolata, and Fagus hayatae. The classification of the European beech, Fagus sylvatica is complex, with a variety of different names proposed for different species and subspecies within this region (for example Fagus taurica, Fagus orientalis, and Fagus moesica). Research suggests that beeches in Eurasia differentiated fairly late in evolutionary history, during the Miocene. The populations in this area represent a range of often overlapping morphotypes, though genetic analysis does not clearly support separate species. Within its family, the Fagaceae, recent research has suggested that Fagus is the evolutionarily most basal group. The southern beeches (genus Nothofagus) previously thought closely related to beeches, are now treated as members of a separate family, the Nothofagaceae (which remains a member of the order Fagales). They are found in Australia, New Zealand, New Guinea, New Caledonia, Argentina, and Chile (principally Patagonia and Tierra del Fuego). The European beech (Fagus sylvatica) is the most commonly cultivated, although few important differences are seen between species aside from detail elements such as leaf shape. The leaves of beech trees are entire or sparsely toothed, from 5–15 cm long and 4–10 cm broad. Beeches are monoecious, bearing both male and female flowers on the same plant. The small flowers are unisexual, the female flowers borne in pairs, the male flowers wind-pollinating catkins. They are produced in spring shortly after the new leaves appear. The bark is smooth and light grey. The fruit is a small, sharply three–angled nut 10–15 mm long, borne singly or in pairs in soft-spined husks 1.5–2.5 cm long, known as cupules. The husk can have a variety of spine- to scale-like appendages, the character of which is, in addition to leaf shape, one of the primary ways beeches are differentiated. The nuts are edible, though bitter (though not nearly as bitter as acorns) with a high tannin content, and are called beechnuts or beechmast. The beech blight aphid (Grylloprociphilus imbricator) is a common pest of American beech trees. Beeches are also used as food plants by some species of Lepidoptera. Beech bark disease is a fungal infection that attacks the American beech through damage caused by scale insects. Infection can lead to the death of the tree. Fagus sylvatica was a late entrant to Great Britain after the last glaciation, and may have been restricted to basic soils in the south of England. Some suggest that it was introduced by Neolithic tribes who planted the trees for their edible nuts. The beech is classified as a native in the south of England and as a non-native in the north where it is often removed from 'native' woods. Large areas of the Chilterns are covered with beech woods, which are habitat to the common bluebell and other flora. The Cwm Clydach National Nature Reserve in southeast Wales was designated for its beech woodlands, which are believed to be on the western edge of their natural range in this steep limestone gorge. Beech is not native to Ireland; however, it was widely planted from the 18th century, and can become a problem shading out the native woodland understory. The Friends of the Irish Environment say that the best policy is to remove young, naturally regenerating beech, while retaining veteran specimens with biodiversity value. A campaign by Friends of the Rusland Beeches and South Lakeland Friends of the Earth launched in 2007 to reclassify the beech as native in Cumbria. The campaign is backed by Tim Farron, MP, who tabled a motion on 3 December 2007 regarding the status of beech in Cumbria. The common European beech (Fagus sylvatica) grows naturally in Denmark and southern Norway and Sweden up to about the 57–59°N. 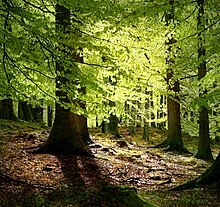 The most northern known naturally growing (not planted) beech trees are found in a few very small forests around the city of Bergen on the west coast of Norway with the North Sea nearby. Near the city of Larvik is the largest naturally occurring beech forest in Norway. Planted beeches are grown much farther north along the Norwegian coast. Some research suggests that early agriculture patterns supported the spread of beech in continental Europe. Research has linked the establishment of beech stands in Scandinavia and Germany with cultivation and fire disturbance, i.e. early agricultural practices. Other areas which have a long history of cultivation, Bulgaria for example, do not exhibit this pattern, so how much human activity has influenced the spread of beech trees is as yet unclear. As a naturally growing forest tree, it marks the important border between the European deciduous forest zone and the northern pine forest zone. This border is important for wildlife and fauna, and is a sharp line along the Swedish western coast, which gets broader toward the south. In Denmark and Scania, at the southernmost peak of the Scandinavian peninsula, south-west of the natural spruce boundary, it is the most common forest tree. In Norway, the beech migration was very recent, and the species has not reached its distribution potential. Thus, the occurrence of oak in Norway is used as an indicator of the border between the temperate deciduous forest and the boreal spruce – pine forest. Fagus sylvatica is one of the most common hardwood trees in north central Europe, in France alone comprising about 15% of all nonconifers. 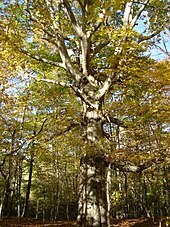 The American beech (Fagus grandifolia) occurs across much of the eastern United States and southeastern Canada, with a disjunct population in Mexico. It is the only Fagus species in the Western Hemisphere. Prior to the Pleistocene Ice Age, it is believed to have spanned the entire width of the continent from the Atlantic Ocean to the Pacific, but now is confined to east of the Great Plains. F. grandifolia tolerates hotter climates than European species, but is not planted much as an ornamental due to slower growth and less resistance to urban pollution. It most commonly occurs as an overstory component in the northern part of its range with sugar maple, transitioning to other forest types further south such as beech-magnolia. American beech is rarely encountered in developed areas unless as a remnant of a forest that was cut down for land development. Beech wood is an excellent firewood, easily split and burning for many hours with bright but calm flames. Slats of beech wood are washed in caustic soda to leach out any flavor or aroma characteristics and are spread around the bottom of fermentation tanks for Budweiser beer. This provides a complex surface on which the yeast can settle, so that it does not pile up, preventing yeast autolysis which would contribute off-flavors to the beer. Beech logs are burned to dry the malt used in some German smoked beers, giving the beers their typical flavor. Beech is also used to smoke Westphalian ham, various sausages, and some cheeses. The textile modal is a kind of rayon often made wholly from reconstituted cellulose of pulped beech wood. The European species Fagus sylvatica yields a utility timber that is tough but dimensionally unstable. It weighs about 720 kg per cubic metre and is widely used for furniture framing and carcase construction, flooring and engineering purposes, in plywood and in household items like plates, but rarely as a decorative wood. The timber can be used to build chalets, houses, and log cabins. The fruit of the beech tree, known as beechnuts or mast, is found in small burrs that drop from the tree in autumn. They are small, roughly triangular and edible, with a bitter, astringent, or in some cases, mild and nut-like taste. They have a high enough fat content that they can be pressed for edible oil. Fresh from the tree, beech leaves in spring are a fine salad vegetable, as sweet as a mild cabbage, though much softer in texture. The young leaves can be steeped in gin for several weeks, the liquor strained off and sweetened to give a light green/yellow liqueur called beech leaf noyau. In antiquity, the barks of beech tree were used by Indo-European people for writing-related purposes, especially in religious context. Beech wood tablets were a common writing material in Germanic societies before the development of paper. The Old English bōc and Old Norse bók both have the primary sense of "beech" but also a secondary sense of "book", and it is from bōc that the modern word derives. In modern German, the word for "book" is Buch, with Buche meaning "beech tree". In modern Dutch, the word for "book" is boek, with beuk meaning "beech tree". In Swedish, these words are the same, bok meaning both "beech tree" and "book". Similarly, in Russian, the word for beech is бук (buk), while that for "letter" (as in a letter of the alphabet) is буква (bukva). Beech litter raking as a replacement for straw in husbandry is an old nontimber practice in forest management that has been widespread in Europe since the 17th century. Beech has been listed as one of the 38 plants whose flowers are used to prepare Bach flower remedies. The beech most commonly grown as an ornamental tree is the European beech (Fagus sylvatica), widely cultivated in North America and its native Europe. Many varieties are in cultivation, notably the weeping beech F. sylvatica 'Pendula', several varieties of copper or purple beech, the fern-leaved beech F. sylvatica 'Asplenifolia', and the tricolour beech F. sylvatica 'roseomarginata'. The strikingly columnar Dawyck beech (F. sylvatica 'Dawyck') occurs in green, gold, and purple forms, named after Dawyck Botanic Garden in the Scottish Borders, one of the four garden sites of the Royal Botanic Garden Edinburgh. Europe is also home to the lesser-known Oriental beech (F. orientalis) and Crimean beech (F. taurica). ^ Wilf, P.; Johnson, K.R. ; Cúneo, N.R. ; Smith, M.E. ; Singer, B.S. ; Gandolfo, M.A. (2005). "Eocene Plant Diversity at Laguna del Hunco and Río Pichileufú, Patagonia, Argentina". The American Naturalist. 165 (6): 634–650. doi:10.1086/430055. PMID 15937744. Retrieved 2019-02-22. ^ Denk, Thomas with Guido Grimm and Vera Hemleben. 2005. Patterns of Molecular and Morphological Differentiation in Fagus (Fagaceae): Phylogenetic Implications. American Journal of Botany 92(6):1006-1016. ^ a b c d Shen, Chung-Fu. 1992. A Monograph of the Genus Fagus Tourn. Ex L. (Fagaceae). Ph.D. Dissertation, City University of New York. ^ Gomory, D. with L. Paule, R. Brus, P. Zhelev, Z. Tomovic, and J. Gracan. 1999. Genetic differentiation and phylogeny of beech on the Balkan peninsula. Journal of Evolutionary Biology 12: 746-752. ^ Denk, Thomas with Guido Grimm, K. Stogerer, M. Langer, Vera Hemleben 2002. The evolutionary history of Fagus in western Eurasia: Evidence from genes, morphology and the fossil record. Plant Systematics and Evolution 232:213-236. ^ Manos, Paul S. with Kelly P. Steele. 1997. Phylogenetic analysis of “Higher” Hamamelididae based on Plasid Sequence Data. American Journal of Botany 84(10):1407-1419. ^ Lawrence, Gale. A Field Guide to the Familiar: Learning to Observe the Natural World. Hanover: University Press of New England, 1984. 75-76. Print. ^ "beech." The Columbia Encyclopedia. New York: Columbia University Press, 2008. Credo Reference. Web. 17 September 2012. ^ beech bark disease." Dictionary of Microbiology & Molecular Biology. Hoboken: Wiley, 2006. Credo Reference. Web. 27 September 2012. ^ "International Foresters Study Lake District's greener, friendlier forests". Forestry Commission. Retrieved 4 August 2010. ^ "Cwm Clydach". Countryside Council for Wales Landscape & wildlife. Archived from the original on 25 September 2010. Retrieved 4 August 2010. ^ "Sitka Spruce in Ireland Reviewed". Forestry Network Newsletter. Friends of the Irish Environment. Archived from the original on 1 February 2009. Retrieved 4 August 2010. ^ "?". South Lakeland Friends of the Earth. Retrieved 4 August 2010. ^ Armstrong, J (2007-10-19). "Saving Our Beeches". North West Evening Mail. Archived from the original on 2010-10-28. ^ "UK Parliament – Early Day Motions By Details". ^ Bradshaw, R.H.W. with N. Kito and T. Giesecke. 2010. Factors influencing the Holocene history of Fagus. Forest Ecology and Management 259:2204-2212. ^ Saskia Pronk-Tiethoff (25 October 2013). The Germanic loanwords in Proto-Slavic. Rodopi. p. 81. ISBN 978-94-012-0984-7. ^ Douglas Harper. "Book". Online Etymological Dictionary. Retrieved 2011-11-18. ^ Bürgi, M.; Gimmi, U. (2007). "Three objectives of historical ecology: the case of litter collecting in Central European forests" (PDF). Landscape Ecology. 22: 77–87. doi:10.1007/s10980-007-9128-0. ^ Gimmi, U.; Poulter, B.; Wolf, A.; Portner, H.; Weber, P.; Bürgi, M. (2013). "Soil carbon pools in Swiss forests show legacy effects from historic forest litter raking". Landscape Ecology. 28 (5): 385–846. doi:10.1007/s10980-012-9778-4. ^ McGrath, M.J.; et al. (2015). "Reconstructing European forest management from 1600 to 2010". Biogeosciences. 12 (14): 4291–4316. Bibcode:2015BGeo...12.4291M. doi:10.5194/bg-12-4291-2015. ^ Scalenghe, R; Minoja, A.P. ; Zimmermann, S.; Bertini, S. (2016). "Consequence of litter removal on pedogenesis: A case study in Bachs and Irchel (Switzerland)". Geoderma. 271: 191–201. Bibcode:2016Geode.271..191S. doi:10.1016/j.geoderma.2016.02.024. "WCSP". World Checklist of Selected Plant Families – Fagus. Eichhorn, Markus (October 2010). "The Beech Tree". Test Tube. Brady Haran for the University of Nottingham.